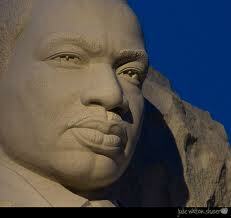 Thoughts and a Prayer on Martin Luther King Day | When I Survey . . .
(Last month I was visiting my son in Washington, D.C., and I revisited the Lincoln Memorial where Martin Luther King gave his “I Have a Dream Speech.” I also visited the Martin Luther King Memorial for the first time. It was dedicated in 2011, and this was my first time in Washington since then. I was deeply moved by both monuments, and struck by how much of Dr. King’s Dream, especially around economic justice, is still unfulfilled. People often forget that he was not only a tireless worker for civil rights, but also for peace, and the rights of workers and the poor. “Lord God, we give you thanks for the blessings you have so generously lavished upon us, for all the ways you provide for our life with both daily bread and spiritual nourishment. It may be cold outside, but let us be warm in here, warmed by the presence of this congregation, warmed by the memory of Martin Luther King, and warmed by the power of your Holy Spirit, whose fire kindles our courage, and makes us bold for your kingdom and its righteousness. Forgive us those times and places when we have let you down, when we have not answered to the better angels of our nature, when we have danced to the world’s tune and listened to the seductive voices of the powerful and privileged as if their voice was your voice, and worshiped the manifold idols of our own imaginations. Turn us again to you and your righteousness. Keep us from the temptations of an easy virtue and a pious complacency. Remind us that the commitments to righteousness, justice and peace for which Dr. King lived and died are still not accomplished. This entry was posted in prophetic ministry. Bookmark the permalink. This is Michelle Penner, previously Michelle Miller from good old NHCC. I just wanted to let you know that I enjoy reading your posts on the Daily Devotionals. They are heartfelt and inspiring. And I can’t help but reflect back to the good old days….when Martha lived across the street, whiffle ball games in the Talis front yard with John, the coffee house. and of course Godspell. Love to you and your family! So good to hear from you, and thanks for the kind words. I remember you and your family well. I recall my first year in Maine you and the NHCC youth group came up for a visit. Martha’s mom and dad still live in Newton Highlands and go to NHCC. Hope you and yours are thriving.